So begins one of the most caustic dramas ever constructed in Hollywood, or about Hollywood, and it was gifted to us by screenwriter-director extraordinaire Billy Wilder. His previous hard-edged film noir Double Indemnity had its own cynical narrator with a memorable voice-over of his own. However, Walter Neff was only on the verge of dying. When we hear the voice of Joe Gillis he is already speaking from the grave. It is a fantastic angle in which to look at this seemingly perfect Hollywood construction, and Gillis never ceases to tell his story until we wind up at the pool as the story comes to a close. For now, we learn that six months back Joe (William Holden) is a writer who is having difficulties being published, and some men want to repossess his car. Desperate, he pays a visit to a friend at Paramount named Mandrake to pitch an idea, but the script is of little merit according to a pretty young script reader. That’s a dead end so Joe leaves, but the men are waiting for him and he zooms away. A flat tire leads him to drive away into an empty garage connected to a dilapidated old mansion on Sunset Boulevard. There he is mistakenly introduced to drama queen Norma Desmond (Gloria Swanson) who used to be big on the silent screen, back in the day. Now all she has is money, fan letters, and old memories to rehash, while her butler Max (Erich von Stroheim) watches over her. The theatrical actress believes her big comeback is soon at hand, and when she learns Joe is a writer, she takes an interest. He needs the money so he takes a look at the rough script meant to be a vehicle for her. A small commitment turns into a life-consuming undertaking. Desmond constantly hovers and dotes over Joe, going so far as having his things moved into her home and buying him new clothes and trinkets. He reluctantly accepts the first class treatment, not minding the cushy lifestyle. But to Norma, it’s more. He is her closest companion. Her love. Joe cannot bear to tell her that she is washed up and that there will never be anything between them. He ditches her intimate New Years party for a more friendly affair where he crosses path with his old bud Artie (Jack Webb) and his girl, the previously critical script girl Betty Schaeffer (Nancy Olson). She takes an interest in a few of his past ideas, but he does not, and after getting shocking news from Max he is pulled back to his lavish prison. Eventually, Norma is prepared to drop off her script with her former collaborator the great Cecil B. DeMille. However, it becomes all too clear that her story will amount to nothing, but her friend cannot bear to break her heart. She is sent off again with the strong conviction that her day is coming. Makeover’s, diets, and facials follow in preparation. Joe is indifferent to it all and secretly begins working at nights with Betty on a new screenplay. Desmond finds the script and jealousy takes over, causing her to call Betty to ruin the romance that is rapidly budding there. Joe hears it all and angrily tells the disbelieving Betty to come see his set-up on Sunset Boulevard. He acts as if he likes the life, and Betty leaves broken-hearted. Soon after, a fed-up Joe packs his bags to head back to Ohio. Thus, begins the systematic breakdown that we had expected for so long. Norma Desmond completely falls apart and does the one thing she knows to hold on. Back in the present the crowds and journalists have turned out to see the has-been movie star who is stark raving mad, and one last time Norma does not disappoint. She glides seamlessly down the stairs with a serenely ethereal look on her face before preparing for her closeup. So ends the career of one Norma Desmond and the life of Joe Gillis. We can only hope that Betty got together again with Artie, otherwise this would remain one of the bleakest tales of all time. However, that is part of the power of this film. It is strangely dark and ominous. Franz Waxman’s score is fit for a Gothic melodrama and Desmond’s mansion is a creaky old foreboding castle that hardly sees the light of day. Max is a solemn figure who we learn brought Norma stardom, married her, got divorced, and then could not live without her. Joe Gillis gets caught in a cycle he cannot get out of, and in the middle of the whole mess is Desmond herself. She is so preoccupied with herself, so obsessed with her own former glory, and yet she is a lonely, insecure aging actress. In many ways, she is Citizen Kane’s female counterpoint. A person with so much money, prestige, and power who slowly drifts away into oblivion without anyone caring except ravenous journalists. Much in the same way, although Norma is so petty and vain in so many ways, I cannot help but feel sympathy for her sorry existence. She is an utterly pitiful person in the end. No one deserves her fate. In this way, Sunset Boulevard seems to critique Hollywood, a place that makes stars like Norma Desmond and spits them back out just as easily. It is not easily figured out or understood it just does at is pleases. For instance, Billy Wilder became an immigrant writer and director of great repute. Cecil B. Demille was a longtime respected director. Erich von Stroheim had early success with silent films then had to turn to acting. Gloria Swanson was a silent star then struggled in the 1930s. William Holden broke out in the 30s, hit his peak in the 1950s and continued to act into the 70s. Nancy Olson went on to make a few classic Disney movies and Jack Webb, of course, went on to create the TV Show Dragnet. Each Hollywood career starkly different from the others. There is also such an authenticity in this film so much so that sometimes the line between fiction and reality is blurred. First, Wilder cast Gloria Swanson to play former silent star Norma Desmond in the film, so it seems like she is playing herself (Complete with old promotional photos and silent footage). He also had appearances by both von Stroheim and Demille, who had each directed Swanson in her silent days. Some of Desmond’s bridge friends include other real silent stars including Anna Q. Nilsson, H.B. Warner, and the legendary Buster Keaton (His career had also crumbled). Even gossip columnist Hedda Hopper gets into the mix to tell the tragic story of Desmond, and it all works. That’s Norma Desmond in a nutshell for you. That’s Sunset Blvd. This entry was posted in 1950s, Crime, Drama, Film Noir, Romance and tagged Billy Wilder, Buster Keaton, Cecil B. Demille, Charles Brackett, Erich von Stroheim, Film Noir, Gloria Swanson, Great Film, H.B. Warner, Hollywod, Nancy Olson, Review, William Holden by 4StarFilmFan. Bookmark the permalink. ‘Citizen Kane’s female counterpoint’, very good observation. Great ending line as well. 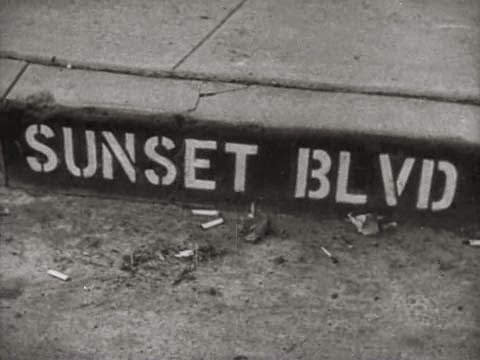 ‘That’s Sunset Blvd’. Thoroughly enjoyed your review. One of my favourite movies. Such kind words! This is a wonderful film again and again.